The best way to help you understand how to craft your natural Entrepreneurial talents and be more patient with the behavior that aren't doing you many favours currently. 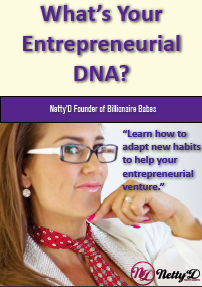 Learning about the behavioral science of your eDNA and how to adapt new habits to help you in your entrepreneurial venture. Behavioral Language has been in existence since people began watching other people. By learning behavioral language and opening up your eyes you will take quantum leaps in not only business but also in your interpersonal communication as you interact with people on a daily basis and improve your entrepreneurial craft to bring the best out of yourself by creating win/win situations and the best of others around you. Step 1: Answer the questions below relating them to you in your normal everyday business/work persona. Step 2: Working Left to Right, place the Number 4 next to the word that best describes you at work, 3 to the word that is next best descriptive of you at work, then 2 and finally the allocate the number 1 to the word that is least descriptive of you in your work environment. Step 4: The quiz is more accurate when you perform with gut instinct, for that you only have 3 mins to compete it...set your timer. Remember, you can only choose each number once across each row so each item will have a 4, 3, 2 or 1 next to it but non of these numbers are repeated in the same row. Please right click on the icon and choose "save as" to save it to your computer.